As I type this, my thermometer reads -22 degrees outside. That is without the windchill. If that isn’t hearty stew weather, I don’t know what is? 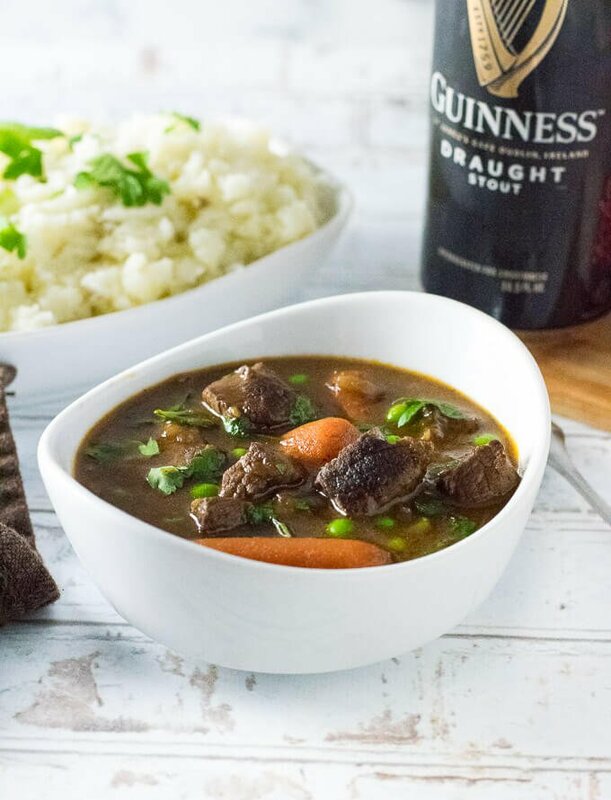 Heck, the whole state of Wisconsin is already hunkered down with a six-pack, so we may as well use one of them to make this flavorful Guinness beef stew! 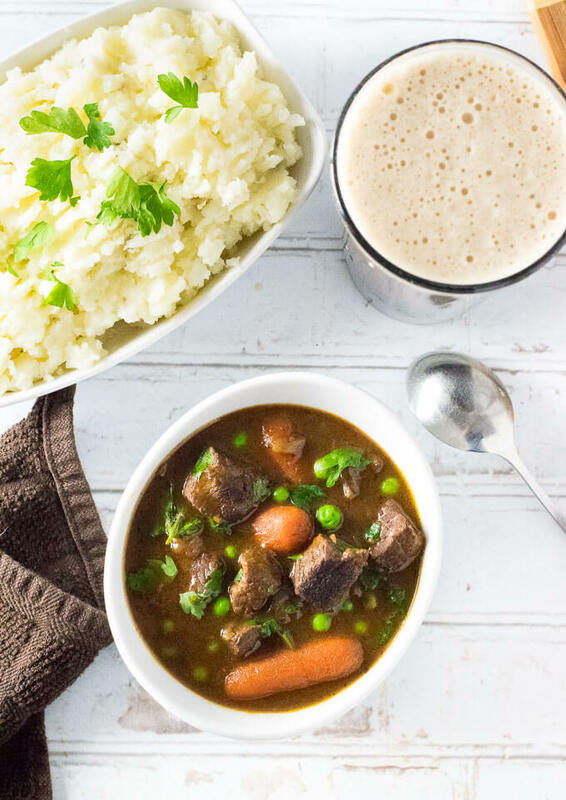 My Guinness beef stew recipe is an Irish-inspired beer infused version of the classic beef stew. 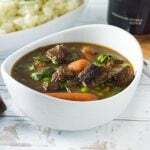 The recipe features flavorful chunks of beef and baby carrots simmered to tender perfection, swimming in a luxuriously thick and silky Guinness infused broth. Guinness is obviously the recommended beer of choice, however, if you do not have Guinness on hand you can substitute another dark beer instead. A stout or a porter would be the best options. 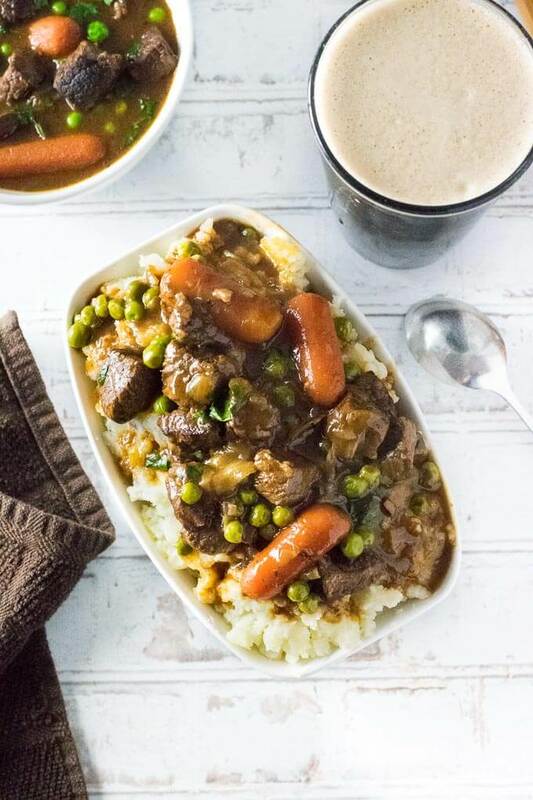 My favorite way to serve Guinness Beef Stew is slathered on a hearty helping of fluffy mashed potatoes. The thick stew acts as an exceptionally flavorful gravy with tender chunks of beef and vegetables. However, it does not HAVE to be served that way. If you prefer to include potatoes in the stew itself, you can do that as well. I would recommend using 1 1/2 pounds of chopped Yukon gold potatoes. Yukons hold up better than Russets in soups and stews. Chuck roast is the best cut of beef when crafting a beef stew. Chuck roast is a tougher cut of beef initially, but it transforms into exceptionally tender morsels when simmered in a Dutch oven for a couple of hours. The fat content of chuck roast also helps create a more luxurious and flavorful broth than a leaner cut of meat would be able to achieve. Add cooking oil to Dutch oven set over medium-high heat and add cubed Chuck roast. Sear until browned on all sides, then remove and set aside. Reduce the heat to medium and add the chopped onions (and more oil if needed), saute until tender, then add minced garlic and cook an additional 2 minutes. Remove garlic and onions from the pot and set aside. Let pot cool slightly, reduce the heat to low and add butter. Once melted sprinkle flour over top to create a roux. Stir continually for 5 minutes, or until roux begins to darken in color. Slowly add beer and beef stock to the roux, mixing to combine as it is added. Return beef, onions, and garlic to the pot and add all remaining ingredients except peas and parsley. Simmer uncovered for 2 hours. Add peas and parsley in the final 5 minutes of cooking. Taste for salt and adjust as needed. Serve alongside or on top of mashed potatoes. IF YOU LIKED THIS RECIPE you will also love my Beer Cheese Soup recipe! If you enjoyed reading my Jalapeno Deviled Eggs recipe then you should probably like me on Facebook and follow me on Pinterest too. That’s what I would do at least, and if you are willing to take my advice on the food you put into your body you should probably follow my advice on that too. I like your recipes, but you don’t have that much! I also like your spices because I like to spice my food with the real ingredients. 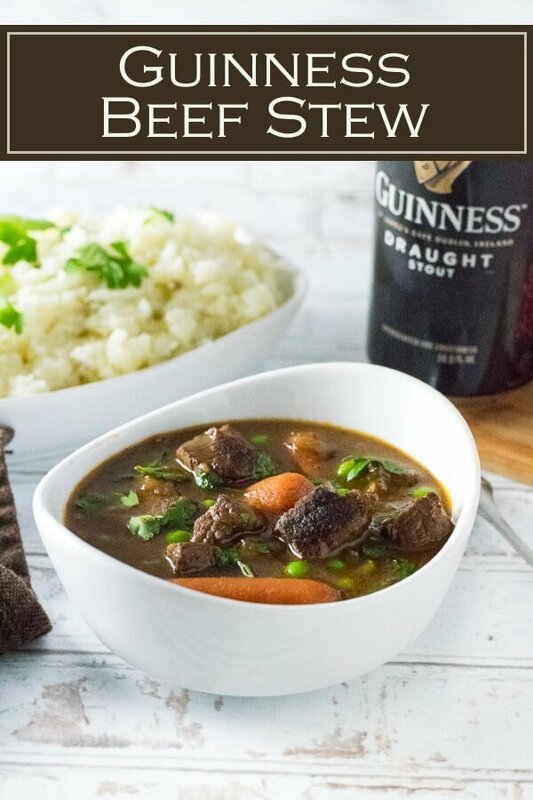 I think your beef stew with Guinness should taste real good. Want to try it, used to drink Guiness. Can’t wait to see what more stuff you have for the kitchen! I am glad you enjoy them! I currently have over 600 recipes on this website, was there one you were looking for but unable to find? Made your Guiness beef stew last night and it was a definite hit. It was fun to put it all together and the flavors were absolutely delicious. This will be a keeper!